You guys. This is really personal and not something I normally share about publicly (or at all) but I wanted to share my story because this person's story resonated with me. You can do this, too. About a year ago my dad and I both wanted to lose some weight, so we made a bet (a milkshake - his idea) on who could lose 7 pounds first. I have successfully lost weight before on the Atkins diet and Weight Watchers, so I was pretty confident I could win that even if I hadn't been able to keep it off before. 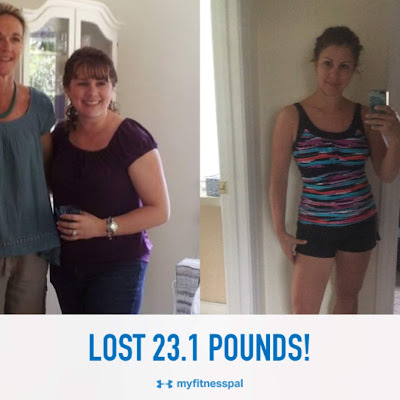 My friend Pam and I were already power walking together a couple times a week, and then my friend Blair invited me to walk the track with her at the Y. I joined up and had my training appointment where I was measured and introduced to their equipment. They use an app that keeps track of my weight machine settings and tells me which exercises and how many to do, which made it easier for me than having to remember or drag a clipboard around the weight room. And LifeFitness has an app that syncs my elliptical workouts with the MyFitnessPal app, where I track what I eat and try to stay within a calorie budget. I get extra calories to burn if I work out and I haven't cut out any foods categorically, so I basically work out in order to eat more goodies. Not the best nutrition goal, but I also learned to appreciate the bargain of veggies and the expense of things like pecans and bread. A trainer once told me that losing weight is 80% about what you eat, so if you don't change that you won't see a difference in your body. That is so true and I love delicious food, so now I just try to enjoy smaller portions of everything. 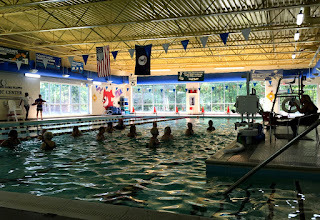 When the kids got out of school last summer we went to the Y a lot. Sometimes the kids' leaders take them to run on the indoor track and celebrate when the kids reach milestones ("Mom, I got my Marathon medal! "), so it's fun and healthy for them, too. 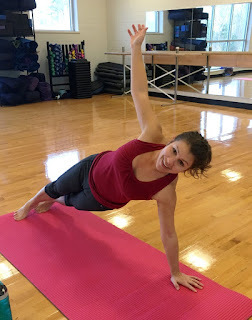 I discovered group exercise classes like PiYo, Tabata, and Barre which gave structure to my week and kept me coming back. I will do pretty much anything as long as I have a friend to do it with! During the summer I started noticing differences in how my arms looked and my clothes fit, and that was super motivating. Slowly the number on the scale was going down. By fall I had lost about 18 pounds, which makes a big difference on a short person. Historically I lose my steam when I reach my goal, but this time I got some good momentum with these changes and just kept going. It doesn't feel like work any more, just part of my day. My favorite group exercise classes are offered on Monday/Wednesday/Friday, but the ones on Tuesday/Thursday don't really do it for me so for a while I'd just lift weights or walk with a friend. 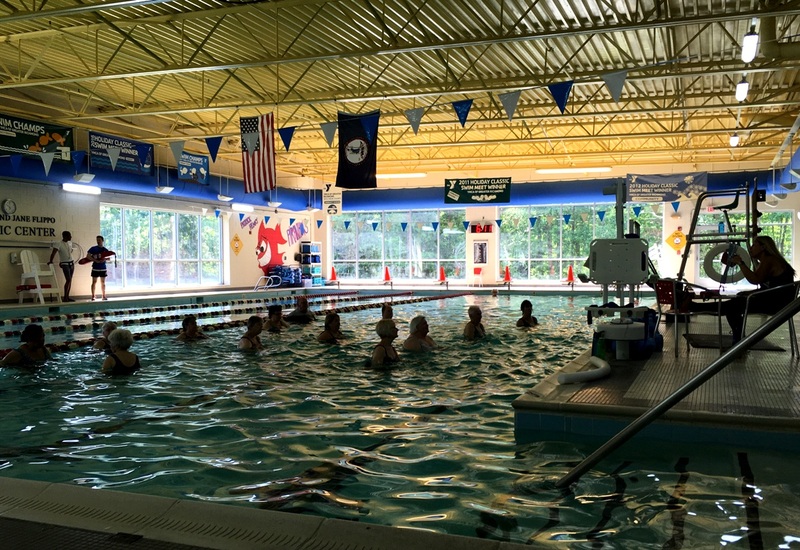 But last fall I checked out the water fitness classes. Steve and I are used to bringing down the average age wherever we go, but I definitely felt like I stuck out like a sore thumb. 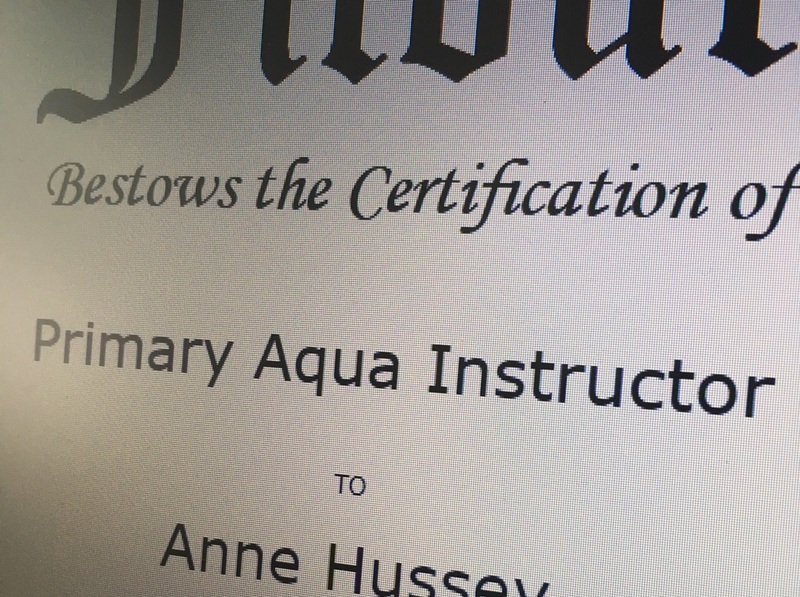 The aqua ladies are very sweet and I liked the instructors, so I started going more regularly. I love that the water feels fresh and I always get a good workout even though it doesn't always feel challenging at the time. (Some mornings I'll walk downstairs and wonder what I did to make me feel so sore). This spring the class coordinator asked if I'd consider getting certified to teach since she's always looking for subs. I mean, I'm there all the time anyway, but teaching something is a whole lot harder than just showing up for class. 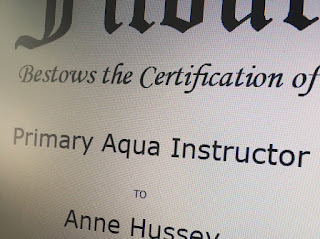 I did study anatomy, physiology, and physics in college, though, and my group exercise instructors are really good about teaching correct form, so those components feel natural for me. My teaching experience is with jewelry-making, though, so I will have to learn to project my voice. The aqua ladies have figured out I'm being recruited and are already coaching me on moves that they like and don't like. They're adorable. We talk quilts and baking in the locker room. A couple more thoughts. If you're thinking about going to a gym, the time of day makes a difference in what your experience is like. Just like shopping at the grocery store, the night & weekend crowd is way different than who you see during the day. Weekdays at our Y have the sweetest, non-threatening group of people to work out with. No meat-heads. Also there's wi-fi so I can watch shows on Netflix and it makes the time on the treadmill go faster. Podcasts while walking the track are good, too. Also? If you need help changing what you eat, try tracking your food with the MyFitnessPal app with a buddy. Then you can cheer each other on when it announces that somebody is under her calories for the day, completed a workout, or lost some weight. (It just shares the positive stuff). And it feels like someone else cares, which is motivating to me. I had been tracking my food on and off with friends a few years ago while we were living in Sweden, and I still love seeing their victories pop up on my feed, across the pond. I turned 40 in January and actually felt excited about it. Finally at my routine checkup I didn't have to hear about how I need to make lifestyle changes. I had abdominal surgery in February (everything is fine now) and the recovery was so much easier than it might have been back in my marshmallow chapter. I keep the weight off pretty well without tracking my food (which can feel like a part-time job), so that's a relief. I don't want to hide behind my clothes anymore. I like the way my face looks in pictures. Yes, it's a lot of time and work, but it's worth it. Oh and yes, my dad did buy me a milkshake!